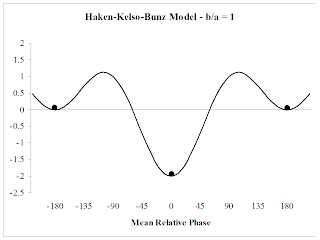 This will be a brief post to follow on from the last, in which I reviewed the early learning studies of Kelso & Zanone that led to the dynamic pattern hypothesis. Over the past week or two, we've been engaging philosopher of psychology Ken Aizawa on the topic of extended cognition. Ken is co-author of a book, Bounds of Cognition, in which he argues cognition is most definitely not extended in any way. We both think the other is wrong, which is always fun; I've been getting to grips with his argument and trying a few ideas out, and I wanted to take a moment to summarise where I think we're at. Arguing about embodiment with Ken Aizawa over the last few days has opened up a lot of topics that I hope to cover over the next little while. But it also primed me to notice this article at Scientific American by Patrick Haggard and Matthew Longo, summarising a recent paper adding to the growing literature on the neuroscience of tool use. I like this work, and it got me thinking how this relates to the embodied cognition literature; Ken, I'd be interested to hear your thoughts on this on. This basic layout is supposed to describe an intrinsic state of affairs, namely that only 0°and 180°are stable coordinations (+/- 180° are identical except for which limb is lagging and which is leading). 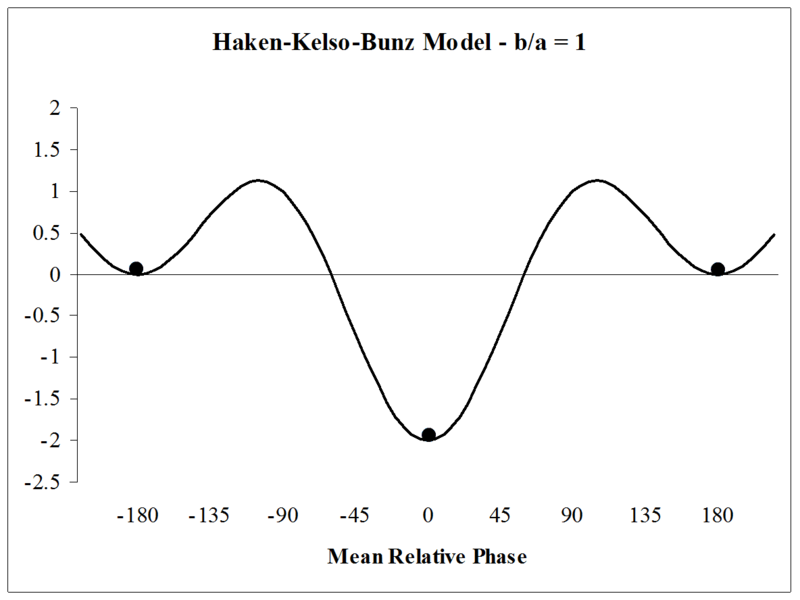 If you look at this function, you will see that potential energy is a maximum at +/90; this suggests that 90°is a maximally unstable coordination (i.e. it takes the most energy to maintain and is susceptible to perturbations which will make behaviour 'run off' towards one or other attractor). This is indeed the case, empirically; people can do it but fail to respond to the inevitable errors that accumulate and they lose the coordination very rapidly. The question then is: can you learn to move at 90°? Is this dynamic pattern modifiable by experience? The first to be called is the engineer, who states: “The size of the stalls for the cattle should be decreased. Efficiency could be improved if the cows were more closely packed, with a net allotment of 275 cubic feet per cow. Also, the diameter of the milking tubes should be increased by 4 percent to allow for a greater average flow rate during the milking periods”. The next to report is the psychologist, who proposes: “The inside of the barn should be painted green. This is a more mellow colour than brown and should help induce greater milk flow. Also, more trees should be planted in the fields to add diversity to the scenery for the cattle during grazing, to reduce boredom”. Finally, the physicist is called upon. He asks for a blackboard and then draws a circle. He begins: “Assume the cow is a sphere....”.